This prime property is ready for development. Centrally located at the major N/S/E/W intersection of US 220 / US 58 Bypass. AADT of 25,000 vehicles south of intersection and 18,000 vehicles north of intersection. Property is adjacent to the Martinsville Speedway as well as BB&T Bank branch, Hardee's, Wilco-Hess, Wendy's and Nissan dealership. 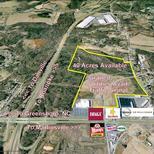 Convenient and accessible to all of Martinsville-Henry County, VA as well as Northern Rockingham County, NC markets. These parcels have been graded and all utilities are available. Located less than 3 miles from the newly opened $9 million Smith River Sports Complex and in close proximity to the future industrial park, Commonwealth Crossing. 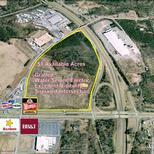 All 51 acres are located in the Enterprise Zone.